World-leading researchers within urban development have completed a major research project aimed at improving life in cities. The study was initiated in response to rising concerns over the impact of climate change coupled with increasing stress from living in dense urban environments, which have prompted a clear need for more liveable and healthier cities. 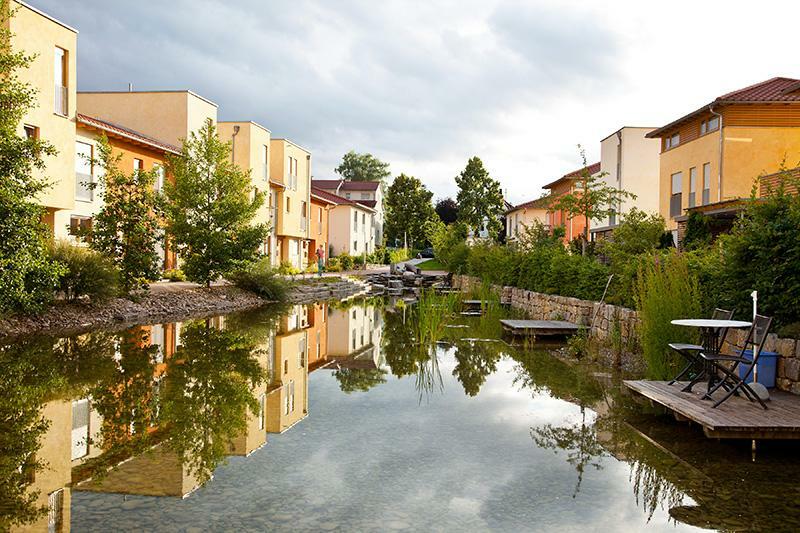 Whilst the benefits of Blue-Green Infrastructure (BGI) are widely recognised and the technology to deliver such solutions is available, widespread implementation of BGI has yet to materialise. To address this, the study explores the socio-economic benefits of BGI and identifies the main challenges, drivers, and enabling conditions for successful implementation of blue and green structures in dense urban areas. Commenting on the research findings, Professor Herbert Dreiseitl, Director of Ramboll’s Liveable Cities Lab which led the project, says, “The study reveals that there are multiple and interrelated benefits associated with BGI. In relation to water, we see that BGI improves water quality and very effectively controls stormwater, which is the cause of increasing incidences of damaging and costly urban flooding worldwide. The study goes on to identify the pre-conditions for the successful implementation of BGI, focusing on galvanising a shift in vision, policy, design and the urban planning culture. In particular, strong leadership and an approach that is inclusive of the interests of different city institutions and citizens help create the foundations for change. A multidisciplinary skillset combining expertise in urban planning, landscape design, water management and urban ecology is also identified as a prerequisite. But change will not happen if the will for collaboration between departments – horizontally and vertically – is not part of the new way of leadership. In addition, building a business case comprising an economic analysis of the full social benefits and costs of BGI compared to conventional approaches is necessary to convince decision-makers of the need for BGI. The research findings conclude with several practical recommendations that cities can consider to enable successful BGI implementation. Herbert Dreiseitl explains, “Articulating a clear vision of the liveability and prosperity advantages of BGI, initiating small-scale pilot projects, and actively engaging key stakeholders will help to inspire, mobilise and create ownership for BGI solutions. The research, which has been funded by the Ramboll Foundation and spearheaded by Ramboll’s Liveable Cities Lab, was today presented by Herbert Dreiseitl and a National University of Singapore research team at an event hosted by the Centre for Liveable Cities (CLC) in Singapore. The study has drawn on the expertise of an international research team from the National University of Singapore, Zeppelin University in Germany, Harvard University’s Graduate School of Design, the Massachusetts Institute of Technology and Ramboll’s Liveable Cities Lab.